Here is an great article on one of the greatest German WWII tank aces, Otto Carius, who had 150+ tank kills during the war. Otto has published a book on his wartime experiences called, "Tigers in the Mud." I have read this book and highly recommend it for those interested in this subject. It is available in print published by Stackpole Books, or as an Ebook from Amazon. The great thing too is that Otto is still alive today and owns a pharmacy in Herschweiler-Pettersheim, Rhineland-Palatinate, Germany, called "Tiger Apotheke." I am posting this article in 2 parts. Otto Carius was born in 1922 in Southwest Germany. In May 1940, Carius volunteered to join the 104th Infantry Placement Battalion. He received training in the infantry before being assigned to the 21st Panzer Regiment, of the 20th Panzer Division. He saw his first combat action in June 1941, during Operation Barbarossa, the invasion of the Soviet Union. 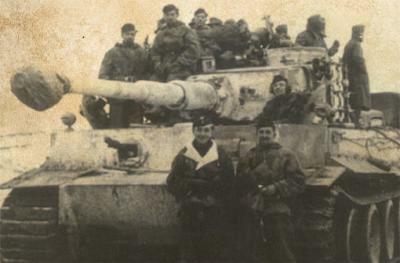 The 21st Panzer Regiment was equipped with the Czech-made Panzer 38(t). Otto Carius served as the tank’s loader in the 10th Panzer Company. When Carius and the rest of his crew received its first Panzer 38(t) tanks they were excited. The tank was fast, manoeuvrable and they felt the armour would protect them from anything the enemy could throw at them. However, as Carius noted, ‘We were enthusiastic about the armour protection and didn’t realize until later that it would only serve as moral protection for us. If necessary, it would stop small arms fire’. Only a month into the Russian campaign, Carius’ tank was hit and the crew had to bail out for the first time. A disillusioned Carius wrote, ‘We cursed the brittle and inelastic Czech steel that gave the Russian gun so little trouble. The pieces of our own armour plating and assembly bolts caused considerably more damage than the shrapnel of the round itself’. Carius was hit in the face, losing several teeth in the process. He recovered at an aid station and hitchhiked his way back to the front. In early August 1941, Carius was promoted to Unteroffizier and received orders to report to the 25th Panzer Replacement Battalion to begin officer training. In February 1942, Carius failed to meet the qualifications for officer and was returned to the 21st Panzer Regiment. He was given command of a Panzer platoon, but the regiment only had enough tanks to equip a company, so his platoon had to fight as infantry until they received new Panzer 38(t) tanks. Carius and the rest of the 10th Panzer Company finally received replacement tanks and joined the fight once again.During the fighting in the early summer of 1942, the regiment received its first Panzer III and IV tanks, which helped even the playing field against the tough new Soviet T-34 tanks. For his combat experience and leadership Carius was promoted to Leutnant and served as the commander of the battalion’s pioneer platoon. In January 1943, Carius was transferred to the 500th Replacement Battalion. When he arrived, he discovered that the battalion was formed exclusively from Eastern Front Panzer veterans to train on the new Panzer VI Tiger heavy tank. His excitement was somewhat curbed when he was assigned to run the officer’s club instead of taking command of a Tiger. Nevertheless, Carius went to work and met Hauptmann Schober, commander of the 2nd Company. Carius kept him well supplied with French vermouth and Schober saw to it that Carius was reassigned to his company. Soon there after the battalion was renamed the 502nd Heavy Panzer Battalion, and Carius was given command of a Tiger from the 2nd Heavy Panzer Company. After a short stay in France, where the crews became acquainted with their new tanks, the company was dispatched to the Leningrad sector on the East Front. Carius and the rest of the company first saw action in July 1943 and fought for eight straight weeks. In November 1943, the company was moved to counter the Russian breakthrough near Vitebsk and fought to hold open the important highway to Newel. Here, Carius commanded several attacks with his platoon of Tiger tanks and added several more tank kills to his already impressive tally. During the fighting Carius’ gunner had an amazing stroke of luck. Carius wrote, ‘My gunner, Unteroffizeier Kramer, can take credit for a deed that was probably unparalleled on the Eastern Front. That is, he succeeded in shooting down a Russian fighter with a tank cannon ... Kramer, upset by the unrelenting nuisance of these guys, elevated his cannon along the approach route. I talked him in. He took a chance and pulled the trigger. On the second attempt, he hit one of the ‘bees’ in its wing. The Russian crashed behind us’. The 2nd Company, 502nd Heavy Panzer Battalion was then ordered to reinforce the front with the 11th ‘Nordland’ SS-Freiwilligen Panzergrenadier Division at Narva. Carius fought hard and as a result won the Knight’s Cross in recognition of his efforts on 4 May 1944. In Narva, Carius had assumed default command of the company. Oberleutnant von Schiller was officially in command but lacked the respect of the rest of the company. Von Schiller often shrugged off operations onto Carius who picked up the slack and commanded the company in his stead. Good article. Added some more knowledge of WW2 to my brain. Thanks. Nice! Keep these topics up! Thanks IPS! I'm glad you liked it and got something out reading it. Part II will be put up soon! Thanks Pikachu! I appreciate your comment! I have more planned for the future. Look for Part II on "Otto Carius" very soon! Rock On! If anyone wants his pharmacy website, I have it. It has a mailing address, and you can order tigers in the Mud too. Of course, it isn't the translated version...but if you sent some money, I'm sure he'd sign a copy of the English version. Thanks much Rev! I love the history and stories of these great soldiers. They gave so much for their particular countries for which they fought, regardless of how right or wrong the politics of the country were. If you haven't read Carius' book, "Tigers in the Mud", do so, it is an excellent book! I will post Part II on Otto Carius soon. Rock on! I'll put it up in 2 more days or so. Und mein great grandfather, Albert Ernst. I looked up your great grandfather, Albert Ernst, Blitz, and found him be quite a brave and accomplished soldier. He fought in Nashorn, Jagdpanther, and Jagdtiger tank destroyers. In 1943, he destroyed 14 Soviet tanks in one day with 21 rounds at Witebsk, after which he was known as the "Tiger of Witebsk". He was a Knight's Cross recipient and survived the war. There is existing video of he and his unit's surrender to American forces at the end of WWII. Ernst is also one of the tank aces featured in Franz Kurowski's book, "Panzer Aces", volume 1. You must be very proud, Blitz, be related to such a great soldier. 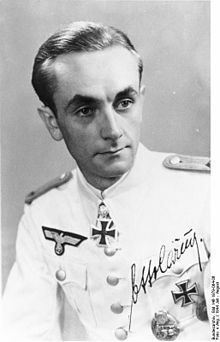 The other one I know of is Ernst Barkmann, the SS Panzer ace in one of the other posts I've put in the "Historical Notes" section. There may be more "Ernsts" that I were Panzer Aces that I haven't read about yet.